Tootoomoo > Blog > Posts > iamtootoomoo > Planning for Christmas means escaping the cold with a pan-Asian party! It’s time to start planning for Christmas, the time is nearly here! You may be thinking to yourself, “Blast! Is it really? I haven’t even thought about Christmas presents yet!” We know last minute shopping on the high streets can be a very frustrating experience, but dining at Tootoomoo this holiday season will be just the opposite. It’s a time to eat, drink, and be merry and to help you get into the festive spirit, we have already started planning your fabulous holiday party menu. With different menu options at Tootoomoo locations in Islington, Crouch End and Whetstone, there are plenty of choices to please all your hungry guests. 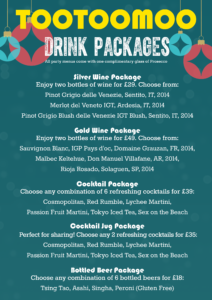 Planning for Christmas just got easier with a range of prices from £18.50 per head. At Tootoomoo Islington your guests will be spoilt for choice because for the entire month of December you can book a Bottomless Xmas package that allows unlimited food and drinks (including booze!) That’s right, bottomless isn’t just for brunch this season. Your guests can indulge in whatever they like regardless if they’ve been naughty or nice. Bookings can be made for parties of 8 or more guests at anytime in December. 1.5 hours of unlimited food and drinks costs £35 per guest or for £40 each guests can stay for 2 hours. Advanced booking is required, please book early to not miss out as we have limited space available during peak times. Tootoomoo Islington can accommodate a maximum of 30 guests. Please email islington@tootoomoo.com to place your booking or for further details. At Tootoomoo’s matriarch restaurant in Crouch End, Chef Ricky Pang has come up with party menus perfect for giving your guests a tour of Asia for the holidays. Not everyone can escape to the Far East for the holidays but there is no reason why we can’t transport you there for at least an evening. With two price options you can plan around your budget and ensure a memorable night for all. 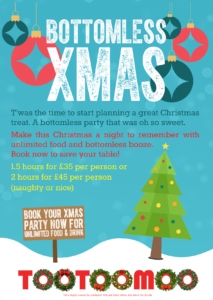 In Crouch End you can also book Bottomless Xmas during the month of December. This is perfect if you’re inviting people with dietary requirements that make dining from set menus difficult. Tootoomoo’s fresh and healthy pan-Asian menu offers lots of gluten free, vegetarian and even vegan dishes, so everyone can leave feeling well catered for. 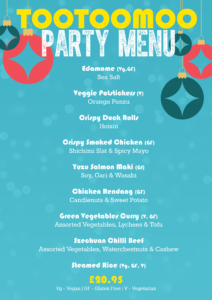 Tootoomoo Whetstone’s party menus offer a different selection and can welcome large groups of up to 100 people for an unforgettable experience. You just need to bring your guests – let us take care of the rest! Upon entering Tootoomoo, you’ll find yourself in a vibrant yet heartwarming environment reminiscent of a classic Asian ‘shophouse’. The restaurant’s bold new look gives an extra taste to your event – it’s eye-catching décor with tile-topped tables and enchanting lights bring a special vibe to the restaurant The open-plan kitchen makes sure that all senses are pampered from the very first moment – sounds of sizzling, smells of freshness and the view of specialties in-the-making are unique additions to the charming ambiance that will give a glamourous start to your holiday party. While the semi-private booths are perfect for more intimate gatherings, the large separate dining room can host bigger groups for a standing reception with cocktails and canapés. Planning on keeping all the celebrations in the office? We’ve got you covered – Tootoomoo N6 Highgate can cater to all your holiday needs, party of 5 or office of 500! Let us step in so you don’t have to. We’ll also be open for New Years, so come and bring in 2018 with a celebratory Tootoomoo cocktail the 31st and 1st. Here’s to a Merry Christmas, and a Happy New Year!